According to research from Shopify, almost 70% of us are guilty of adding items to an online shopping cart, and not carrying out the purchase (aka abandoning the cart!) This is bad for your business as it leads to a large amount of your potential revenue being lost. Particularly during the holiday season, it is important for you as email marketers to try and re-engage busy customers and encourage them to continue their purchase. 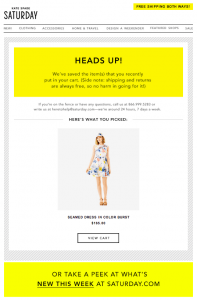 Here are our top tips for creating the perfect abandoned shopping cart email. Your checkout process is too complicated. The whole idea of online shopping is that it’s convenient, quick, and easy – meaning you can effortlessly carry out a transaction from the comfort of your own home. If your checkout process takes too long, your customers will quickly get bored and won’t have the patience to finish purchasing their chosen products. One thing that could slow down or complicate the checkout process is signing up or creating an account. If this isn’t 100% necessary for the transaction, we recommend you leave this step out of the process. Shipping costs are too high. A lot of the time, sites entice customers with really good deals on products, but then deter them with unexpectedly high shipping fees. Consider offering free domestic shipping, or offering free shipping as part of a threshold spend (e.g. free shipping when you spend over $30) to make your shoppers feel satisfied that they are getting the best deal. If your shipping fees are high, try to think about ways you can bring them down. Perhaps you could change your delivery service, or make your packages smaller. It will definitely be worth it for your customers! Not enough payment options. Today’s consumer environment is changing rapidly, and in order to keep up, you have to make your business as flexible as possible. If a customer is faced with limited payment options at the checkout, it is likely they will give up on the purchase from your store, and shop for their products elsewhere. Try to offer as many payment options as possible. Services like PayPal are a great option to have on offer, as this allows customers to quickly and easily complete a transaction without having to look for their card details. Other issues: There are of course many other obstacles which could occur that are out of your control. Your customer may be lacking in money at the time of the purchase, or they may be distracted by something which causes them to leave your site (e.g. a phone call or a crying baby.) They may even run out of battery on their laptop or mobile device. Although inevitable, things such as this provide you with the perfect opportunity to send a reminder email. Let’s get started! If you include the recipient’s name in the subject line, they are far more likely to notice it and open your email. Make sure you name the items which your customer has left in their shopping cart. That way, it will be easier for them to remember the purchase, and they will also be more enticed to open your email when seeing the products they almost bought! Here is an example of an enticing subject line using the Mail Designer 365 subject line optimization tool. Creating a sense of urgency is a very effective way to encourage your customers back to your store’s checkout. Be sure to let them know of any offers which are about to expire, or products which are about to go out of stock. If they think it’s their last chance to get a good deal, FOMO (fear of missing out) will definitely kick in and they’ll want to carry out their purchases as soon as they can. A lot of the time, customers are simply procrastinating and only need a gentle nudge from you to convince them to buy your product. 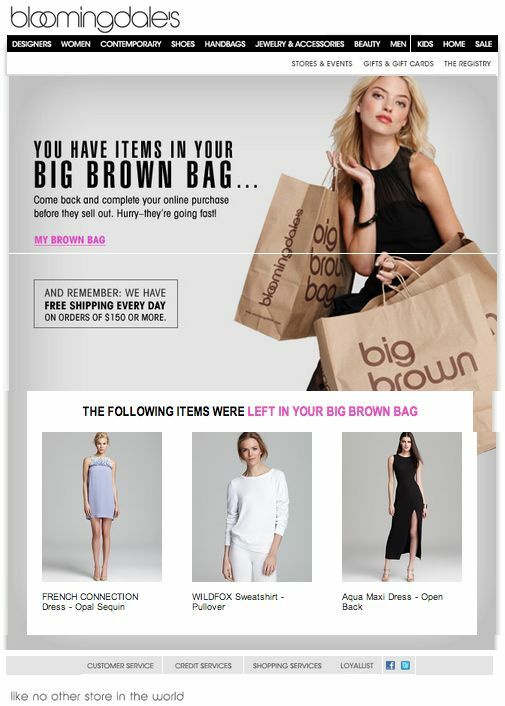 This example from Bloomingdale’s is great, as it puts gentle pressure on the customer to order before their chosen items sell out “Hurry – they’re going fast!” The other great thing about this design, is that it includes the items left behind as a main feature. We will touch upon this more in the next point. As we mentioned before, it’s a good idea to mention the items your customer has left behind, but it’s an even better idea to show them. 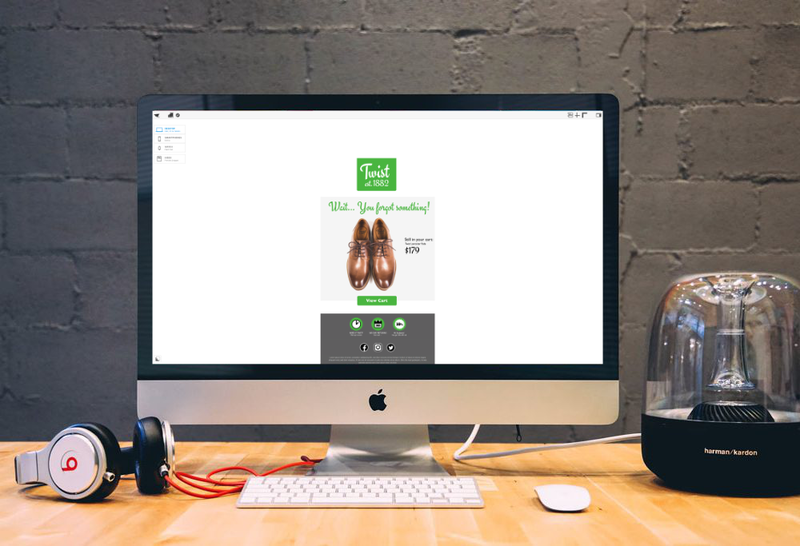 Using images of the items your customer added to the checkout serves as an effective visual reminder; prompting the customer to think about why they added the product to their cart in the first place. If you are a clothing or beauty store, try to include an image of a model wearing the product – the customer will then be able to envision it on themselves and be even more enthusiastic about purchasing. If you sell other goods such as tech items, tools, media etc, try mentioning the benefits and USP (unique selling point) of the items to win customers over. This point is important, but also tricky. Offering an incentive is a great way to encourage your customers to purchase from your online store; however, you also don’t want to give the impression that you are “rewarding” customers for delaying their purchase, as this could inspire them to repeat this behaviour in the future. One really good idea is to take advantage of any offers or promotions you already have going on in your store. It may be that your customer was a day early for your sale, or missed out on a threshold spend offer. Maybe they didn’t notice that you offer free shipping. Rectify this by mentioning your existing offers in your email reminder. This could be the final push your customer needs to encourage them to complete their purchase, and for you, it’s another sale! Guess do a great job of advertising their existing offers in this example. 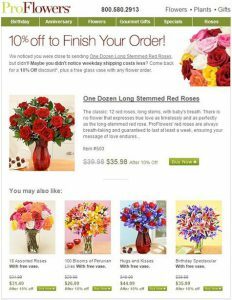 Alongside a dazzling design, they make sure to let customers know they offer free shipping after a threshold spend, and that they offer free returns. This is a great way to encourage customers to get back on your site. Alternatively, you can also offer customers an entirely new offer to persuade them to finish their purchase (although we would advise against doing this too often.) Try knocking a small percentage off the price to convince customers who are debating whether they can afford the item. You could also offer free standard delivery – something which is especially enticing around the holiday period. Take a look at this incentive-style email we created with Mail Designer 365. Maybe the product in question didn’t quite have what it takes to win your customer over, but that doesn’t automatically mean they won’t purchase something else. A good tactic to include in your abandoned cart email is subtly showcasing similar products to what the customer had added to their cart alongside the reminder. If the customer didn’t notice these items before, it’s a sure fire way to peak their interest all over again and get them back on the website. You could also try inserting images of products that make a good accompaniment to what the customer viewed. For example, if they were browsing your store for an outfit, maybe they couldn’t find the right shoes or bag to go alongside the dress they loved. The more you put yourself in the position of the customer, the easier it is to help them! Pro Flowers have nailed the abandoned cart email in this example. Not only have they recommended other similar items as a helpful alternative for their customer, they’ve also added 10% off as an extra incentive. Talk about going the extra mile! It’s unfortunate, but sometimes as hard as you might try, your customer will not revisit your site to complete their purchase. Their could be a number of reasons for this: for example, they could have found what they were looking for elsewhere, or they may no longer be interested in the products they had found on your website. Whatever it may be, finding out why the purchase was never completed will help you improve in the long run. Even if you don’t manage to make the sale now, finding out things you need to improve on as a business/independent seller will help you to make more sales in the future! We recommend you inserting a mailto link or a link to an online feedback form into your email to give customers the opportunity to have their say. Selfridges & Co provide us with a great example of how to reach out to customers following an abandoned shopping cart. 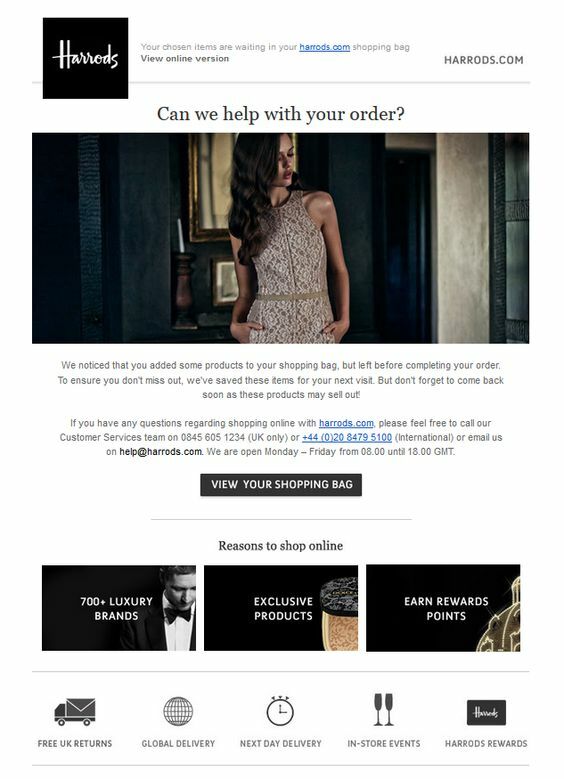 In this email, they give the customer a polite reminder that they did not complete their order but also go a step further to provide the customer with any assistance they might need to finish the transaction. Although this is the final step, it is one of the most important! According to research carried out by SaleCycle, the longer you wait to send your abandoned cart emails, the less effective they will be. This makes sense, because if you remind the customer a long time after the event, the chances are, they’ve either completely forgotten, moved on from the idea, or have already made a replacement purchase. You have to be on the ball. This being said, it’s also not a good idea to send your email too soon, as this could come across as annoying, and maybe even a touch creepy! Remember, your customer may intend to come back to their purchase shortly after closing the tab. We recommend sending your email anytime between 30 minutes and 24 hours after the customer has abandoned the checkout process. Anything outside of this timeframe would be ineffective. Prevention is better than cure – make sure your online checkout process is perfectly optimized to keep as many customers as possible interested. 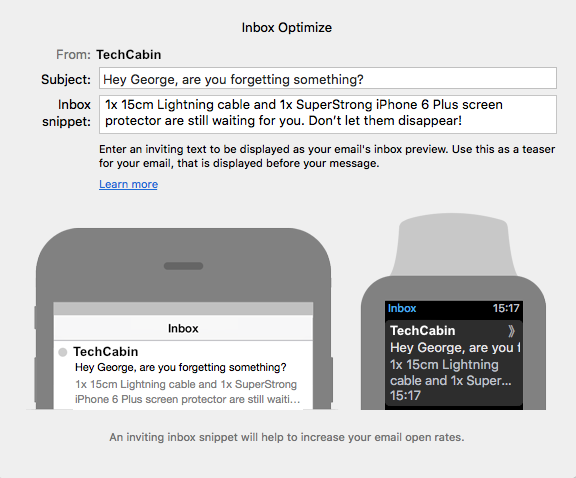 Make your email subject line interesting and informative so your customers want to reengage with you. Also remember to send the reminder out asap before the opportunity has passed! Make the customer’s abandoned products star of the show in your design to win your customers over again. Be prepared to address any problems or criticisms that your customers may have regarding your online store so you can better improve for the future. 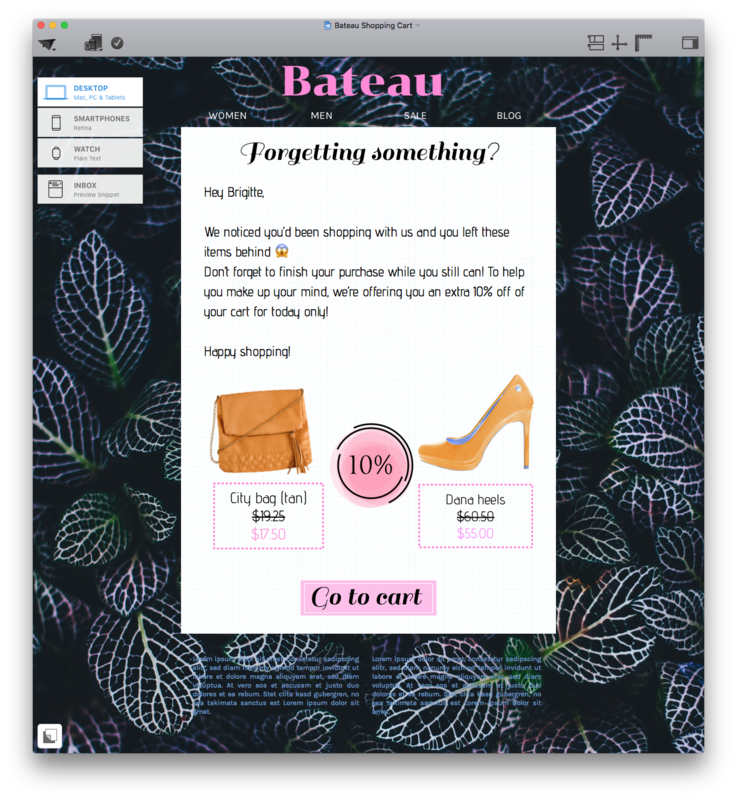 Give our tips for the perfect abandoned cart email a go and see how much you will make up for lost revenue!